No other sport radar is as accurate, sensitive, or has as much range and versatility as the Stalker Pro II and is the first Sports Radar capable of measuring the speed of supersonic objects. Stalker Radar engineers have drawn on Stalker's Direction Sensing Technology and 15+ years of baseball scouting experience to develop the software and algorithms that yield greater range , sensitivity and accuracy. From the rugged cast-metal exterior (waterproof to 2 feet !) to the world's most sensitive transmitter/receiver, to the miniaturised and modernised electronics, to the direction-sensing software, and the baseball-specific algorithms, the Pro II is a new generation sports radar in a class by itself. Not only is the Stalker Pro II the first sports radar capable of simultaneously tracking objects moving both toward and away from the radar, it is capable of measuring speeds in excess of the speed of sound (up to 800 miles per hour or 1287 KM/H). And the Pro II's 10-millisecond acquisition time makes it ideal for virtually any type of sport, game or activity that needs speed measurement. 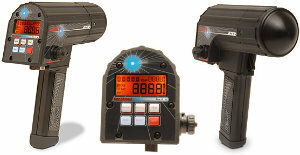 Easy function selection on the Pro II automatically adjusts the internal settings for any type of target. Vehicle Mode: Clock vehicles on land or water up to two miles away. The Stalker Pro II also filters out other vehicles moving in the opposite direction of interest. Tennis Mode: Track balls on either side of the tennis court, as the Pro II's wide beam width measures both the ball's peak (serve) speed as well as the decelerating live speed. Baseball Mode: The bi-directional Pro II measures the peak (release) speed and plate (roll-down) speed of a baseball pitch, as well as the speed of a batted ball (travelling in the opposite direction of the pitched ball). All three speeds displayed at the same time.